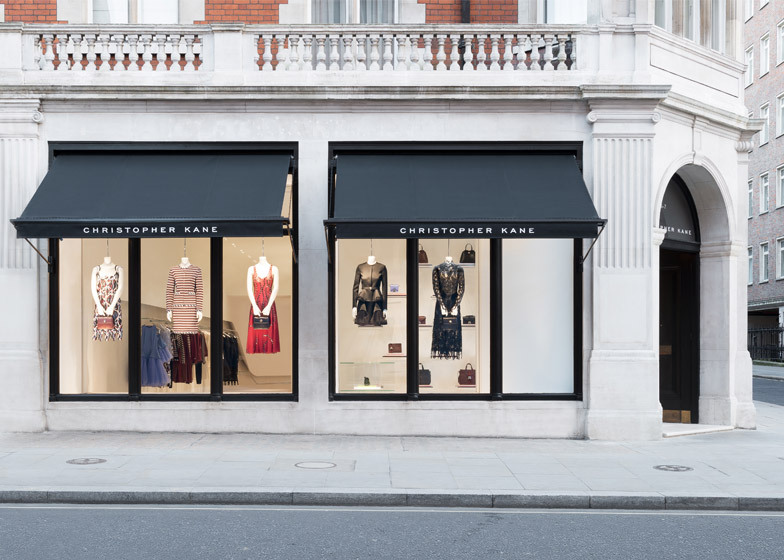 John Pawson has applied his signature Minimalist style to the interior of British fashion designer Christopher Kane's first physical retail space (+ slideshow). 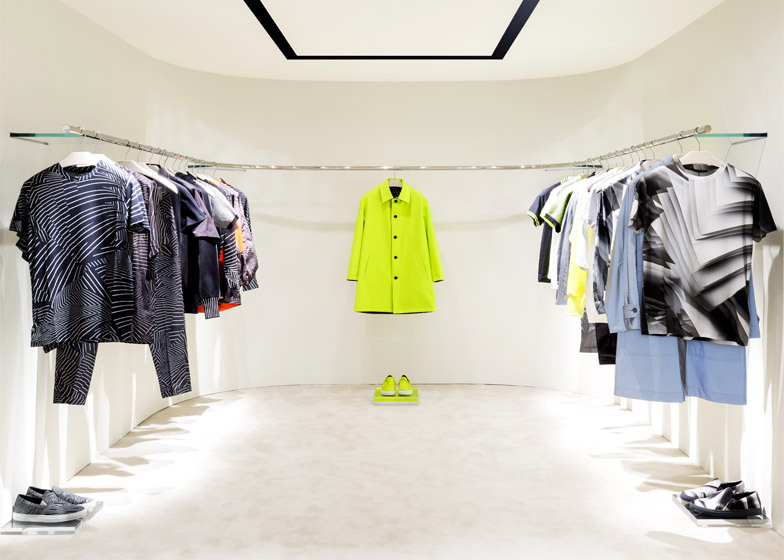 Pawson's design for the Christopher Kane shop – which opened earlier this month on London's Mount Street – features an off-white palette, mirrored surfaces and transparent display cases. "We both wanted to make it comfortable, for people to feel good [in it] and for the clothes to look good against an amazing backdrop," Pawson told Dezeen. Located within a conservation area, the shop is split over two floors in an Edwardian building that was previously a bank and a hairdresser. "We thought it would be nice to keep the Edwardian shopfront, because it breaks it up nicely," said Pawson. "It frames the things you put in the window and you don't see right into the shop, you just get a glimpse." The original wooden doors fold back, so visitors enter through a glass porch into a space illuminated by windows on two sides. Womenswear is mainly displayed on the ground floor, while menswear can be found downstairs. Connecting the two areas is a horizontal steel rail, set into a recessed section of wall and used to hang garments from. "We used highly polished stainless-steel mirroring, which has a nice reflective quality," said Pawson, who is currently also working on the new home for London's design museum. 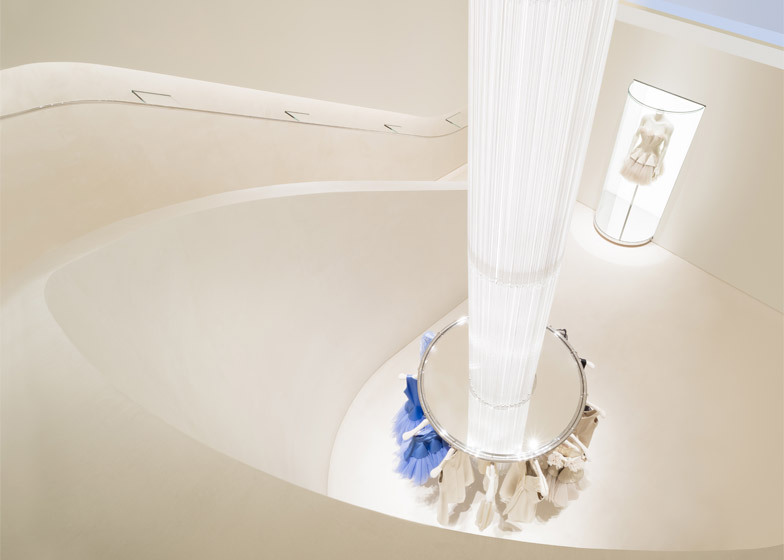 The rail runs along one side of the store and down the staircase, which spirals around a cylindrical chandelier that Pawson compared to a lightsaber from the Star Wars films. The light fixture descends from the double-height ceiling onto a mirrored disk, edged with a circular rail for presenting a chosen few items. Across the store, vitrines for displaying dresses and accessories sit on perspex castors so the displays can be rearranged each season. Reflective panels run floor-to-ceiling upstairs, and are also used as cladding on doors for fitting rooms and stock areas in the basement. Fluorescent-coloured plates are slotted between transparent shelves, echoing the pops of colour that often crop up in Kane's collections. 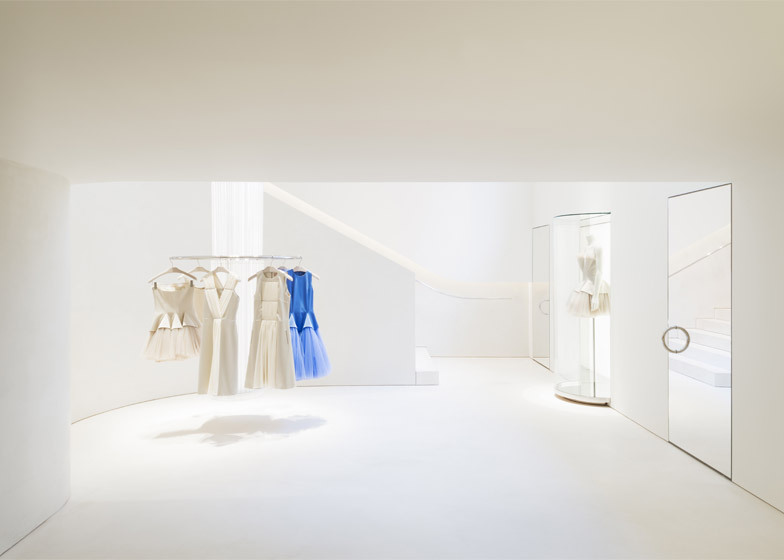 The fashion designer approached Pawson directly to ask him to design the shop, which has opened nine years after Kane started his eponymous label. "There was no beauty parade, or interviewing, or sending books," Pawson told Dezeen. "Christopher Kane asked if he could come to the office, and I said of course." "He has a lot of strong ideas of his own, and I wanted it to be a backdrop for his clothes and for him to recreate his world there," said Pawson. London-based designer Pawson is known for his Minimalist style, with previous projects including a church in Germany and a holiday home for Alain de Botton's Living Architecture project. He has only designed a couple of retail spaces: the 1995 Calvin Klein Collections Store in New York and a branch for Jigsaw in London a year later. "[Kane] obviously liked the Calvin Klein store," Pawson said. "At the time, Calvin wanted a store that maybe he would have designed if he'd been an architect." "[Kane] also wanted a store that was his, and I think that's how it's turned out," he added. "Working with John Pawson, whose work I love and admire, and who made me feel extremely comfortable throughout, was wonderful," said Kane. "John and his team instantly understood what I wanted to achieve with the store, which has made for a wonderful experience." Pawson hinted that he might work on other stores for Kane in the future. Photography is by Gilbert McCarragher.